Medicinal Chemistry has matured as a discipline, and there is no better time than the present to be a medicinal chemist. One of the primary driving forces in this renaissance is the increased value added by collaborations with biology, pharmacology, toxicology, spectroscopy, and allied fields earlier in the drug discovery process. The modern practicing medicinal chemist is inundated with new data, including in vitro and in vivo ADME profiling, which enables informed decisions that increase the likelihood of success in the future. 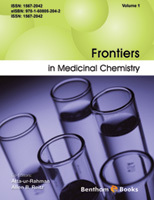 This first issue of Frontiers in Medicinal Chemistry is being published only online, allowing for rapid and broad dissemination of the material presented. The chapters are selected from issues of Current Medicinal Chemistry, Current Topics in Medicinal Chemistry and Current Pharmaceutical Design to represent a cross-section of the most compelling subjects and developments in medicinal and bioorganic chemistry. The manuscripts and topics are clustered thematically, and overall constitute a substantial and impressive body of knowledge. The authors were given the opportunity to update their contributions, and many chose to do that. It is expected that Frontiers will be published on an annual basis in future years. Our thanks to Matthew Honan of Bentham Science Publishers for providing this opportunity.